Sometimes when you see a particular film it stays with you no matter much time has passed. Rain Man with Tom Cruise and Dustin Hoffman is just such a film. Arriving in theaters in the 1980's, it quickly won audiences over with its story of Charlie Babbitt (Tom Cruise) who is an L.A. based auto dealer/hustler/bookie. Charlie has been angry for most of his life, within him he contains the pain and anguish of a boy who was unable to let go of the past. When he was a young boy, Charlie stole his father's 1948 Buick. Being that he knew this was wrong, Charlie didn't tell anyone, especially his father. Unbeknownst to him, Charlie's father reported the car missing. Charlie wound up spending two days in jail because of this and since then has kept his father at a distance. Things change when Charlie hears of his father's passing and attends the reading of the will. It seems Charlie's father had a hefty sum of money when he died, $3 million to be exact and Charlie is not going to see a dime of it. Instead it's being left in a trust to an unknown individual; at least unknown to Charlie. Extremely upset of this turn of events, Charlie does some investigating and learns the benefactor of the money resides in an institute and is none other than Charlie's brother Raymond, played by Dustin Hoffman. Raymond is a savant who has been living at the institute for a long time. Needless to say, Charlie is unsure how to handle all this news of his sibling. Still holding on to his anger for so many things, Charlie comes up with a plan to get the money for himself. Charlie kidnaps his brother to get the money for himself. What starts out as a trip to the west coast becomes a journey of discovery not just for Charlie but for Raymond as well. Along the way, Charlie is finally able to let go of the past and begin to heal while realizing that even though his brother is handful, he can't help but bond with him; forming a connection that was completely unexpected and worth more than any sum of money could ever be. Now the film has arrived on Blu-ray packed up with a number of extras. Besides already having crisp picture and clear audio there are also a number of commentaries as well; each from a key player in the development of this picture, first with director Barry Levinson and two more with writers Barry Morrow and Ronald Bass. Along with those commentaries comes a behind-the-scenes look at the making of the film and a documentary titled "Lifting the Fog: A look at the Mysteries Autism." What really stands out about this film is the smaller story within the larger one and that's the story of two brothers who go through an experience together and discover the unbreakable bond that exists between brothers. 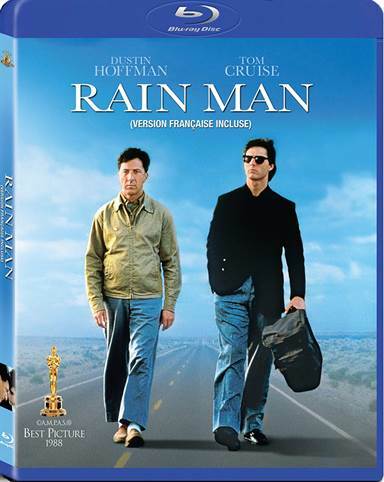 Download Rain Man from the iTunes Store in Digial HD. For more information about Rain Man visit the FlickDirect Movie Database.